Be fabulously funky this summer with a quirky, Japanese-inspired Tokio necklace! 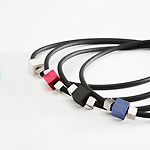 This unique, lightweight design has a black rubber cord with two silver and a single coloured square wooden beads. Just 42cm long, it is the perfect complementary accessory for high necked and V-necked tops and t-shirts alike. The Tokio choker comes in four attractive colours - black, white, aniline red and jeans blue - and priced under £10, it's great value.